Too many surfboards and not enough space? The Hi-Port 2 is your answer. 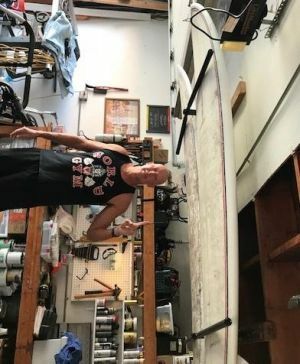 Not only does it free up garage, boathouse or shed space by occupying the under utilized overhead space, but it will also handle a small fleet of boards. With 150 lb. capacity and vertical adjustability, the Hi-Port 2 is purposed designed to cradle as many surfboards as you're willing to stack! What size tube on this product? Our Hi-Port Ceiling Rack has arms with a tubing diameter of approx. 13/16". The foam adds approx. 1/8" all the way around, but compresses almost 100% under SUP/Surfboard/boat weight. I purchased the Hi-port 2 storage rack to store my boards up and out of the way in my garage. Delivery today was fast and the rack is super sturdy and high quality. I would definitely recommend this storage rack. Also its cheaper from www.storeyourboard.com than it is on amazon. It was delivered free in 2 days. 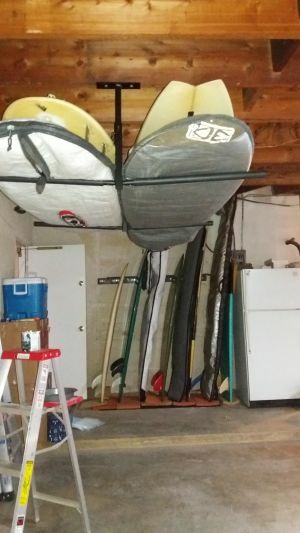 Simple and effective way to make space in the garage while keeping your surfboards safe from damage. Highly recommend! Perfect for the garage!!! Currently holding two longboards and two shortboards. went together and mounted easily, plenty sturdy for a pair of longboards on one side and an enormous old SUP on the other. highly recommend! Works great for my paddle boards. I'm happy to be able to walk around in my garage again. Just finished installing my High Port 2 ceiling rack. It was easy to install and was the perfect solution for storing our paddle boards. I initially ordered a wall mount rack which wasn’t going to work once I decided on the location. I contacted customer service to reorder the High Port 2 and they were very accommodating. Thank you for a great rack and even better customer service. It arrived as advertised and was easy to install. Works great. Well made, sturdy, and easy to mount! it was very easy to put up and the instructions were laid out great. It took me less than 20 minutes to mount and it works perfectly for the kids kayaks and the paddleboard. 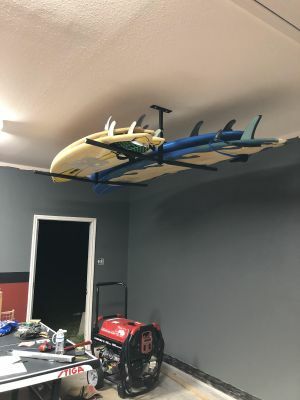 Was able to easily install this in the ceiling of my garage. Opened up a ton of space. fits 2 kayaks perfectly - very easy to install and awesome design! As advertised rack is now supporting two longboards 9'+ and two SUP's in my single car garage. Freed up lots of floor space for....more boards! This was super easy to install and takes about 10 min. It works great, looks good, and leaves you with options depending on what you need to store. Good job guys, your product exceeded my expectations. The installation was easy. I had it up in a short amount of time. The lag bolts this product comes with broke so I had to buy some different lag bolts. Our old racks were a great improvement over the original clumsy 2x4s. However, due to mounting limitations on our garage ceiling, my hubby always had to duck under them. We received the Hi-Port 2 racks and were delighted to realize that he gained an exceptional amount of head room even without mounting them perpendicular to the joists in our garage, which was one of the compelling features about this new product. Oh, Happy Day. Check out my man standing tall with our new Hi-Port 2 racks! Although you see only two boards pictured here, rest assured you could really stack 'em up with these adjustable arms. Thanks ever so much, faithful friends at StoreYourBoard.com!